Wow, The Starved is going to be an extremely hard book to write about. It is one of the strangest and creepiest Gothic romances that I have ever read. Filled with characters who are either mad, vengeful, or indolent, Thompson’s book gives us very few people with whom a reader would want to identify. 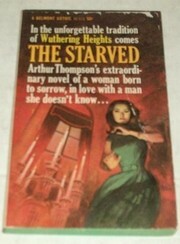 The cover blurb compares The Starved to Wuthering Heights, and as far as I can remember (I read that book when I was in middle school), it is an apt comparison. I don’t think I will ruin the book by saying that–rather like in The Shining, we are following a heroine who is more like the threatening hero of your typical Gothic novel. But effective. Boy, is The Starved effective. Thompson’s book is a page-turner. Although not long, it is incredibly engrossing. The characters are well-drawn, each in their own way, and yet they remain mysterious. The tension heightens, the reader becomes more and more uncomfortable, and the truth about Maud’s situation gets more and more disturbing. Thompson uses a variety of tools to tell his story–everything from traditional narration to reading over the shoulder of his “heroine” as she writes page after mysterious page. The book’s setting is detailed, the world well-developed, and as you can see, absorbing enough to get a rave from me. As for romance–well, it is hard to describe. There is no romance in the typical sense of a Gothic, yet there are two “suitors” to Maud’s hand. Or so it seems. I really can’t say more than that. If the rules for “Character Chemistry” were not what they are, I wouldn’t have given this book a “2,” but I assure you, the writing more than makes up for the reasons I had to give it a lower rating. This may be one of the most confusing reviews I have ever written–but then, this is one of the most unorthodox Gothic novels/romances that I have ever read. I wish I could draw a fuller picture without ruining it for potential readers, but I cannot.